It is also learnt that State Bank of India and General Insurance Corporation invested around Rs 150 crore and Rs 50 crore respectively. State-owned financial institutions subscribed to more than half of the shares of steel major SAIL that were off-loaded by the Centre on Friday in its first divestment offer for the current financial year. In all, the Centre raised around Rs 1,725 crore by selling 20.65 crore shares, representing 5 per cent of SAIL’s equity, at an indicative price of approximately Rs 83.5 per share. A source close to the development told The Indian Express that of the total amount raised by the government in the SAIL issue, almost 55 per cent was invested by five leading financial institutions primarily led by Life Insurance Corporation that invested around Rs 700 crore. LIC alone subscribed to 40 per cent of the total shares on offer. The issue saw a subscription of 207 per cent. LIC’s MD V K Sharma confirmed the state owned insurer’s participation in the Sail OFS without elaborating further. Another MD, S B Mainak, who is in charge of LIC’s investments, refused to take any question. A look into the last five major disinvestments done by the government shows that in two of them — Hindustan Copper (July 2013) and SAIL (March 2013) — state-owned financial institutions had subscribed to more than 50 per cent of the shares on offer and LIC was the major subscriber. Other government-owned financial institutions to participate were United India Assurance and Oriental Insurance. Among domestic private sector players, ICICI Bank is learnt to have purchased shares amounting to close to Rs 100 crore. The FII participation in the issue was, however, limited. Global hedge fund players such as Seganti Capital (investment of close to Rs 100 crore) and Geosphere Capital (investment of around Rs 30 crore) were among the major players. Vanguard is also learnt to have participated with share purchase of over Rs 30 crore. “While the issue has been subscribed, it lacks participation from major marquee global investors,” said a source while highlighting the overall weak interest in state-owned companies. 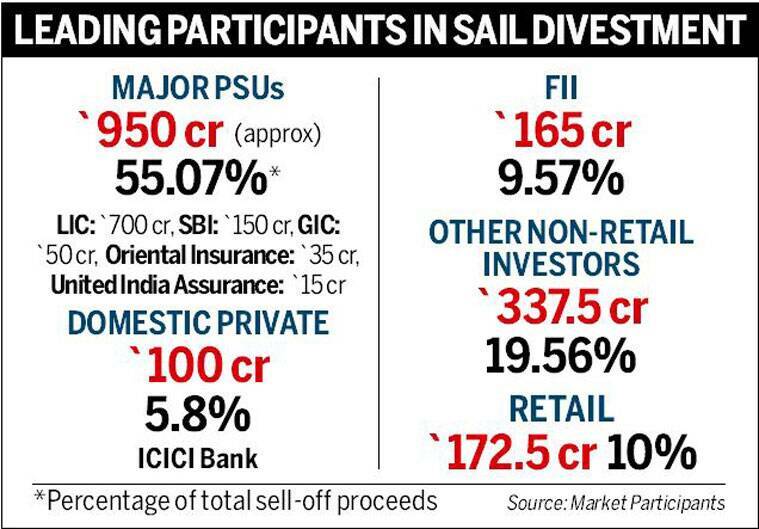 SAIL is only first among the list of companies where the government is looking to divest a part of its holding to raise funds to meet its revenue target for the year. The next in line are Coal India Limited, Power Finance Corporation, ONGC and NHPC. The Centre has set a target to raise Rs 43,425 crore from disinvestment in the current fiscal, which is crucial to fund the fiscal deficit target of 4.1 per cent of the GDP. With weak investor appetite for these stocks, market experts feel that the government-owned financial institutions will play a major role in the divestment process this year too. PSU stocks have lagged in performance even in a bull market that saw the Sensex rise by over 15 per cent since Narendra Modi led government assumed power on May 26. While the broader markets rallied, the public sector index comprising 59 listed state-owned companies saw a 2.2 per cent decline in its value in the same period. This is as opposed to several other sectoral indices that have jumped anywhere between 10 and 50 per cent in the last six months. Market experts attribute the weak performance of PSU index to no visible management reforms in these enterprises contrary to the initial expectations. In fact, as many as 17 PSUs are without a chairman including the likes of CIL, PFC and NHPC. A leading market expert said that the challenge is to turnaround the management, get them out of bureaucratic hands and make them professional.